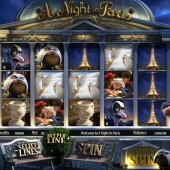 If you load up this great 3D video slot from Betsoft Gaming, whatever you do don’t start spinning the reels until you watch the game’s fantastic intro sequence – a journey into the Parisian night-time as a hapless French burglar attempts to take off with some priceless French artifacts, pursued by security guard and his trusty bulldog. 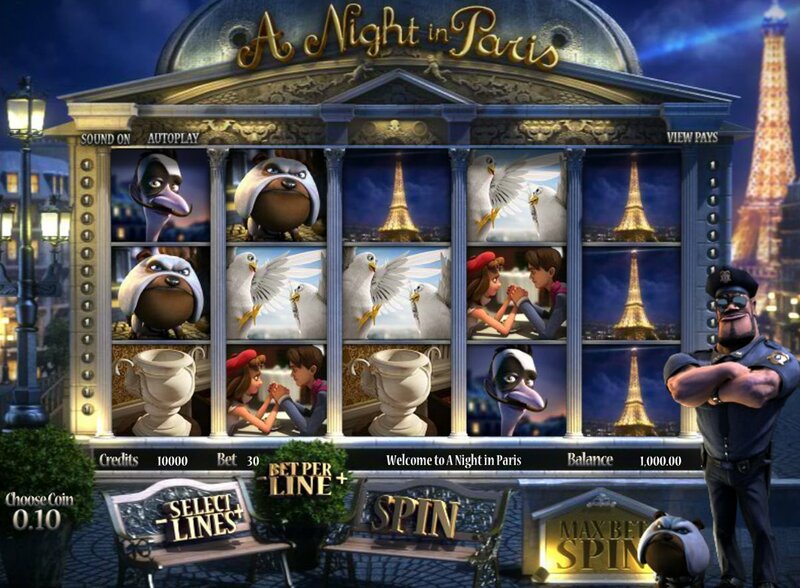 Yes, we’re firmly in Betsoft land here: this 5-reel, 30-payline slot called A Night in Paris has slick intro sequences, perfectly rendered symbols and lovely 3D animation. While you spin the reels our beefy guard Jerome Labaste stands guard on the side of the reels with his pooch snapping at his heels. Meanwhile, our reels spin containing all manner of French fancies: croissants, the Eiffel Tower, a young couple in love, the thief himself plus the guard and his dog, and finally, items from the museum like a portrait of Napoleon, a statue and a vase. Five guards across the reels pays out a maximum $2,500 jackpot. Various special combos on the reels will bag you money. For example, hitting the thief, a security badge, and the guard in a row will bag you an instant prize. Three or more Badge symbols, meanwhile, triggers the Chase Free Spins Bonus. Meanwhile, three or more Napoleon portrait symbols triggers the ‘Caught in the Museum’ round. The thief has entered the museum and it’s up to him to bag goodies until our pal Jerome catches him in the act. Essentially a Pick ‘em Bonus round, just pick priceless booty until you get caught and you are returned to the base game screen. Betsoft’s A Night in Paris is slick gameplay and seamless animation coupled with a nice sense of humor – all of those are in evidence here for sure. In fact, the game is very similar to Betsoft’s take on the Pink Panther – the crime-themed slot, After Night Falls, while NetEnt’s crime caper slot, Crime Scene, is another perfectly adequate addition to your list of must-plays.